A trailer was recently released for the short film, Live A Little, which is set to be released in 2015.This short film is a coming-of-age story that features an imaginative young girl who faces a life-altering turn of events. The story portrays the main character, Haley, and her interactions with family and friends as she comes to terms with what she expects to be her impending death. In addition to being a heart-felt, funny, and touching short film, Live A Little is a great way to see a touch of Steampunk in film. Written by Zack Marotta and featuring Molly McGaughey as director, this 2015 comedy features the acting talents of Sydney Shuck as Haley, a creative young girl of about nine years of age. After becoming convinced that she has accidently poisoned herself by being exposed to dangerous chemicals while cleaning, Sydney is set on completing her bucket list by the end of the day. Feeling that her fate has been sealed, Sydney solicits the help of her friends to complete tasks like kissing a boy, starting a business, and learning Japanese, all in a matter of hours. Sydney Chan plays Haley’s best friend Sonya, and together, they work to complete Haley’s bucket list before the day has ended. 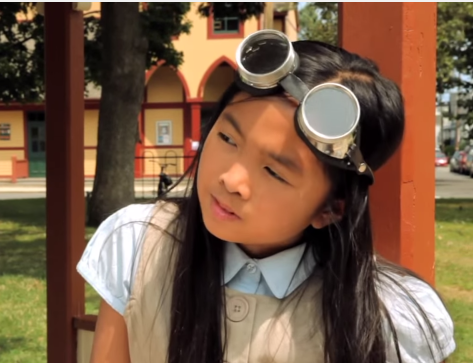 Her young friend gets dragged along on Sydney’s adventures, all while wearing metal steampunk goggles on her head. Before filming began, Freelance Production Coordinator Caryn Novak made a special trip to our store in Hoboken to select a pair of goggles for this role from our vast assortment, and we were thrilled to help! Sydney Chan playing Sonya, Haley’s best friend! Little Sydney Shuck is certainly the star of this show, exhibiting a talent well beyond her years throughout the short film. However, she is supported by a terrific cast, including Amanda Roberge, Greg Wood, Solomon Hailemichael, and Bridget Harvey. Also joining the cast is veteran actor Ashton Crosby, whose film credits also include Sarina’s Song, Tick Tock, and Rectangibles. Live A Little is a must-see short film that is great for all ages.